Selling or buying a company? Acquisition Advisors’ experience spans many industries: manufacturing, distribution, energy, industrial services, petrochemicals, automotive, banking, software, technology, staffing, agriculture, food, retail, consumer goods and service industries. When your mission is to sell a business for absolute maximum sale price, selling a business is a sales process. A business sale is a negotiated item. No list prices to go by. Sure, there are some rules of thumb. Some generally accepted earnings multiple ranges. But the ranges are large. We’re talking doubling and tripling of the prices paid. Millions of dollars hang in the balance for the prospective seller of a midsize company. Pair this with the fact that every business seller wants to sell for maximum value and the question becomes: How does the business owner go about securing maximum value? Acquisition Advisors knows how business sale prices are maximized. It’s through skilled packaging, process and dealmaker skill. Presentation matters. Autos on the car lot sell for more than they do in the driveway. Antiques sell for more in the antique store than in the garage. Businesses sell for more when packaged colorfully and professionally. The generic foods fad flopped. People want colorful, pretty packaging and they’re willing to pay for it. But to maximize the sale price of a business, the packaging must also address a fundamental need of the business buyer: the need for information. Position the seller as low risk, i.e., honest, cooperative, trustworthy and fair. In concept, the process that maximizes sale price is simple. Identify the best buyers in the world for the particular business and then work them simultaneously against each other. Basically, run an auction. It takes a lot of work, time, energy, communication, experience and skill. But the results, when done right, can literally be golden. Shocking as it may be, buyers don’t like to be “worked.” They like to call the shots. Get things their way. If someone is getting worked, they like to be the one doing it. Most experienced buyers of midsize companies are smart and confident. Strong personalities as well. They don’t like to simply be run through an auction process where the highest bidder wins. So, this is where the M&A dealmaker skill comes in. Either they can run this process and keep the buyers engaged or not. Businesses can’t be sold on packaging, process and dealmaker skill alone, of course. The key is the core value of the business itself. So, there’s no free lunch. Building a valuable business is the tough part, to be sure, but the prices at which businesses sell are negotiated items. They vary widely and position themselves naturally along a bell curve. The question is: How does one go about securing a price that’s way out to the right on the x-axis? The answer is, of course, packaging, process, and dealmaker skill. What does this mean for you, the prospective business seller who desires absolute maximum? Secure skilled representation. Hire the most talented M&A advisors you can get. If you own a business with annual profit in excess of $1 million, you’ll earn your investment back in multiples. I think this is a great article and would love to profile it on our blog as a featured article. 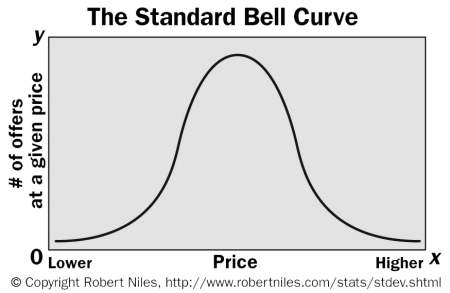 I took a good look at your graph and the components of what drives the total price for a business. 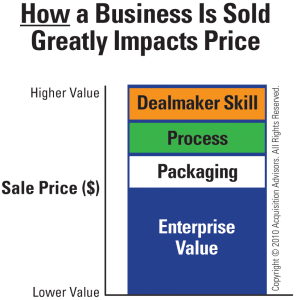 I’m not sure whether you intended to draw it to scale or not, but the graph suggests that over 50% of the value is determined by package, process, and dealmaker skill. I would argue that that ratio is a bit high, and suggest that the EV of the busniness purely ‘on its merits’ (free cash flow, predictability of P/L, risk of obsolescence or lack thereof), drive at least 50-60% of the value, which still leaves a huge amount of value to be added by the appropriate dealmaker. I have a business which avergaes 500,000.00 min profits at year end and normal profit of 800,000.00 to 900,000.00 in a normal year . Recession years being at 500,000.00 or above that . Ive been in business here for 30 years have ongoing customer base in a expert oppinion what should I ask for my business the trend is up at present . I have approx 1,200,000.00 in asets and no debt .